What is No Medical Insurance? No Medical Insurance is an interesting category of insurance that has grown over the last number of years both in product and the number of insurance carriers that now offer such products. Traditionally, this category of insurance was made available to people who, by regular standards, would simply not qualify for life insurance due to their health history that may include, most notably: cancer, heart disease, stroke, by pass surgery, stent insertion, chronic kidney and liver disease, diabetes (with additional complications), and so on. The amount of insurance was usually restricted to under $50,000 and was usually of the permanent (lifetime) variety. Today, as demand grows, No Medical life insurance coverage has increased to $500,000, and the variety now includes term insurance for 10, 20 and 25 years as well as permanent insurance (lifetime), and critical illness insurance. No Medical Insurance usually means there is no paramedical nurse that will visit and no medical records will be checked or requested from your doctor during the underwriting process. It does not mean that there will not be medical questions that will have to be answered in order to issue the policy. The number of questions varies from company to company. There may be pre-qualifying questions, followed by eligibility questions, followed by more questions to determine what category you fit in –which will determine the overall cost. There may only be one question: Do you live in Canada? Generally, the fewer the questions, the lower the maximum amount of insurance will be, and the greater the cost. Questions may be replaced by declarations. Read them carefully to make sure that you do not have any of the conditions listed since you are in effect declaring that you do not. There are many different options and no two application questionnaires are alike. There are many differences in what each company considers a serious health issue and it pays to have a qualified agent walk you through the questions and help you get the best price possible. 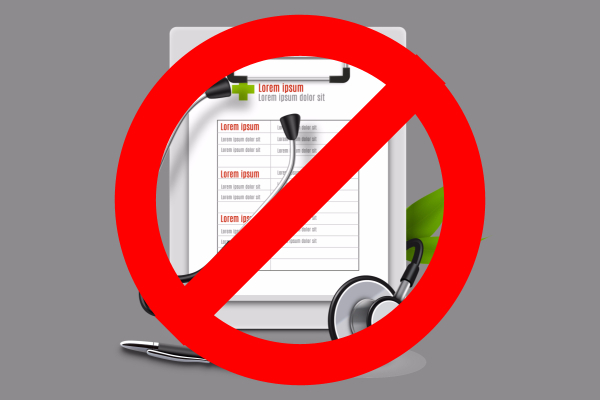 Most (but not all) No Medical plans are deferred. That means that you are insured for the first two years (but check your policy in case it is more or less) for death caused by accident only. After the deferral period you are then covered for death regardless of cause. The key to remember with NO Medical plans is that you are answering questions or making declarations that will be verified AFTER death. Unlike traditional insurance where the file is underwritten during the application process; No medical insurance plans will be underwritten after death occurs. The answers to the questions or declarations must be accurate in order for the claim to be paid. It is important to make sure you are dealing with an insurance professional during this process. They can help you understand the insurance products available to suit your needs and budget and help you navigate the questions correctly. Chances are that they have run in to similar conditions with other clients and can further clarify the questions with underwriters. However, only you and your doctor have knowledge of your health status. If you are not sure whether you were diagnosed with, for example, cardiomyopathy or angina, then solicit the help of your doctor. Find out the exact condition(s) you were diagnosed with and the exact dates. Was it two years ago, was it three years ago? Dates matter. Questions and/or declarations will be time referenced. After all, your doctor is whom the insurance company will request the final report from in order to approve or deny the claim.